Mangalore also known as the gateway to Karnataka lies nestled between the blue waters of the Arabian Sea and the green, towering hills of the Western Ghats. Named after the deity Mangaladevi, Mangalore has always been a bustling port with the first references to this place being dating back to the 14th century. Given its strategic location, this city has been ruled by many kings over the period of time. These different rulers have left their mark in this charming city and it is today, an amalgamation of various cultures. In addition to this, the city has retained its importance as one of the leading ports in India and handles a major portion of India's coffee and cashew exports. Here is a guide to the city of Mangalore. Sultan Battery is situated in Boloor that is around 4 km from Mangalore city. This place is known for the watch tower located amidst the beauty of nature. It is believed to have been constructed by the emperor Tipu Sultan in the year 1748 A.D. The tower, built with black stones, was constructed to obstruct war ships from entering the river, the primary route for English invasion. Though the place holds a watch tower, it looks much more like a fort with mounting places for canyons. There is an underground storage area under the tower which was used to store gun powder and other artillery equipments. It was also a naval station and this place was of great importance to the ruler as he used it to intercept enemy warships from docking. If you climbs to the top of the watch tower you get a panoramic view of Arabian Sea that is sure to leave you speechless. The place is a blend of natural and manmade beauty. Though it is deserted now, it is slowly gathering popularity among tourists. Someshwar beach, located 18 km south of Mangalore is a place with seemingly endless sandy beach with the lining of swaying palm trees. The beach is well known for 'Rudra Shila' a large rock to be found here. A temple, believed to be constructed during the reign of Abbakka Devi, is also another major attraction here. 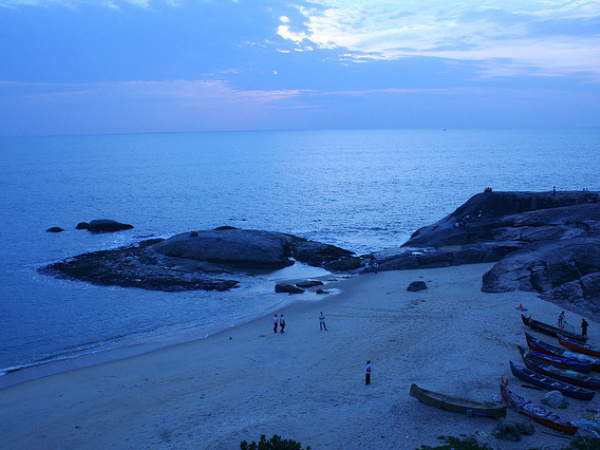 The beach offers an awesome view of Arabian Sea and has ruins of a fort and a palace. The best season to visit this place is from October to February. Travellers coming here can relax on the beach or head out and explore the ruins that are to be found here. You can also indulge yourself in various water sports here. The Mangala Devi Temple which is 3 km southwest to the city of Mangalore is surrounded by many forts. The temple dates back to 9th century founded by the King Kundavarma who ruled Tamil Nadu. The Goddess Mangaladevi is the main deity of the temple and special pujas are conducted here during Navarathri season. On the ninth day of Navarathri festival, a grand procession called Rathothsava is conducted when the deity is carried on a grand chariot. People have a belief that visiting and offering prayers at the temple brings good times. Ganaeshotsav is also celebrated in this temple in a big way. The temple is easily accessible from Mangalore city by bus. This temple is of special significance to the maidens as it is believed that young women who pray here will get a suitable match and have a happily married life. Tannirbhavi Beach is located in a place called Panambur, 10 km north of Mangalore. The beach is deserted and sees only a few visitors. It is apt for travellers who love secluded enjoyment of nature. It is a perfect place to head to and relax under the sun kissed sand. You can also indulge in a few activities here like playing volleyball on the beach or enjoy a game of cricket. Those wanting to venture into the waters should bear in mind that there are no lifeguards here and hence have to be careful. By Air: Mangalore airport is an international airport with connectivity to different national and international destinations. By Train: Mangalore Central and Mangalore Junction are the two stations of Mangalore. It is well-connected to Bangalore, Chennai, Mumbai, Hassan and various other important cities in the country. By Road: Mangalore can be approached through NH-13, NH-17, NH-48 by road. Karnataka State Road Transport Corporation buses are available from Mangalore to various other destinations within the state. White coloured taxis and auto rickshaws are available for local transport. So when are you heading to Mangalore?